SAAREMAA MUSEUM > To researchers > Publications > Saaremaa Muuseum. Kaheaastaraamat 2011–2012. Kuressaare 2013. 325 pp. For the first time, Bishop Magnus of Oesel–Wiek and of Courland granted Kuressaare (then Arensburg) a city charter in 1563, the act was repeated by the King of Denmark, Frederik II in 1574. The next king, Christian IV, did not confirm Arensburg’s privileges and only Queen Christina did it in 1646 after Saaremaa (then Oesel) passed to Sweden. The troops of Peter I did conquer Oesel in 1710, but Kuressaare’s privileges were only confirmed by Empress Yelizaveta in 1742. It is noticeable that until the period of Swedish rule that not the German term Stadt, but Weichbild was used to denote Kuressaare in the privileges and other documents. An analysis of middle and early modern age sources makes it possible to state that Weichbild was a descriptive term that referred to a more rustic type of settlement, as a rule one that was not protected by a city wall and to which the lord could grant a city charter (villages could not get it). So the Danish authorities did not express any legal reservations in calling Kuressaare a Weichbild with respect to the city rights of the place, but simply used the term traditionally used for such centres. From assuming the post of the Saare–Lääne (Oesel–Wiek) bishop to the first return trip to Denmark (April/May 1560 – end of January 1561). This period marked preliminary success: purchase of the posts of the Kuressaare and Tallinn bishops, occupation of the bailiwick of Maasilinn (Soneburg), taking into his service the revolting mercenaries of the Livonian Order, forced acceptance by the Order of nearly all this, and a total political and financial crash: a Russian foray into Wiek, a peasant uprising, a mercenaries’ revolt, the Livonians, disappointed in their expectations, turning their back to Magnus, rapid growth in debts and its alleviation by means of benefices. Under the control of royal vice-regents until his second return to Denmark (from May 1561 to May 1563). In that period he unsuccessfully attempted not to become involved in the outbreak of the Nordic Seven-Year War. Among other things, he granted the Riga charter to Kuressaare and extended the privileges of the Oesel–Wiek vassals. Episodic stays on Saaremaa until the island passed under Magnus’ immediate power (from late autumn 1564 to early 1567). Under the pressure of his brother, King Frederik II, Magnus returned to Livonia, but mainly resided in Courland. Wiek had already been lost to Sweden. Among other things, based in Courland, he took part in a mercenaries attempt to take over Tallinn from the Swedes in 1565. At the end of the period Frederik II removed under the pressure of the widowed Queen Dorothea from his office the Saaremaa vice-regent Christoffer Valkendorff and the island once again passed under Magnus’ direct power. In the way of the war (early 1567 – spring 1569). Magnus’ hopes for the assistance of his brother, as well as the Polish–Lithuanian and Courland Duke, Gotthard Kettler, were not fulfilled. Military campaigns were unsuccessful and he felt constantly endangered by the Swedes, who occupied also a part of Saaremaa. From the first contacts with the diplomatic agents of Ivan the Terrible in Livonia, Johann Taube and Elert Kruse, up to the time when a trip to Moscow was undertaken (spring 1569 – spring 1570). Not finding another option, Magnus launched cooperation with Tsar Ivan and launched an adventure known as the Kingdom of Livonia. In the interests of speedier mail carriage he stayed once again in Saaremaa at the end of the period. Hiding from Ivan the Terrible (end of October 1571 – end of May 1572). Failure of the siege of Tallinn 1570/71 and the Stettin Peace Treaty that was disastrous for the project of the Kingdom of Livonia took Taube and Kruse to an unsuccessful attempt to occupy Tartu from the Russians with mercenaries’ assistance. Magnus fled to Saaremaa from the Tsar’s wrath and started to look for opportunities to leave from Livonia, but a new sharp controversy with Frederick II influenced him to find conciliation with Ivan the Terrible. Before his final departure he made a number of new vassalages and attempted to bring the chivalry to give up their Danish subjection and come under his power alone. Except the last seven-month period, Magnus did not stay constantly on the island but stayed there only temporarily, preferring Piltene and other strongholds of the Courland Bishopric because of the threat of war. Under the supervision of Garel Püüa extensive field studies took place in the territory of the Kuressaare (Arensburg) episcopal castle in 2010–12. The data received update and correct ideas of the layout of the castle and the story of its formation. By its type Kuressaare was a water castle that was built on a low-lying coastal area. The centre of the castle complex is a convent building by its type that followed the tradition of the Teutonic Order, on the northern corner of which stands the massive defence tower, Sturvolt, and in the eastern corner the Tall Hermann slightly projects from the line of the wall. The main castle has been partly built on a natural elevation but the original ground at the side of the sea is only 150 centimetres above sea level in some places. As a result, work at raising the surface of the yard and levelling it out must have been begun immediately. Researchers have expressed quite different views about the formation of the main castle of Kuressaare. Armin Tuulse believes that the convent building was intended to be put up right away and that Sturvolt was the first part to have been built. But Kalvi Aluve, who headed restoration work in the 1970s and 80s, claims that Tall Hermann was put up first as an independent guard tower, which was later integrated into the composition of the new main castle. In an article published in 1995 Kaur Alttoa and Boris Dubovik reached the conclusion that the oldest part of the core building is the present lower part of Sturvolt and an adjoining room on its south-western corner. In fact, that view, too, requires substantial corrections and additions. Summing up the results of the last field investigations and earlier digs (by K. Aluve) it is possible to state that the original layout of the castle included, in addition to Sturvolt and an adjacent side building, also a defence wall enclosing the site which ran along the outward perimeter of the later convent house. As a result, a castellum (defence wall) with a tower has been first built at Kuressaare and their outer dimensions were identical with those of the later convent building. It is conspicuous that transition between the castellum and the convent building are quite accidental in some places. It can be presumed that the castellum has never been completed: work has suddenly been interrupted at a certain point (perhaps due to the uprising of the local people’s in 1343-45?). Bearing in mind the whole building volume normal building work on the site has lasted for a dozen years or slightly longer. Later on the convent building already was built. So we can believe at the present situation of investigation that the building of the main Kuressaare castle was begun at about in the late 1320s. By its type it was a castellum with an intended tower at the northern corner. Building of the castle was interrupted in 1340. Later there has been a major change in the building plans: a convent house was put up with its outer walls supported on the perimeter wall of the former castellum. The first citizens of Kuressaare were traders, fugitives of war, who applied for civic rights from Count Magnus in order to continue their way of life in Saaremaa. Their dwellings stood on the esplanade between the Kuressaare Castle and the village. Magnus’ privilege of 1563 was based on the Riga Charter, but treated Kuressaare as a village (Weichbild). The Riga Charter, which rested on the Magdeburg Charter, was in effect also in other Estonian cities: Tartu, Pärnu, Viljandi and Haapsalu. Kuressaare received a hayfield (Bürgerkoppel) and plots where the town hall, the weigh house and the traders’ guild house could be built. A city council independent of the castle administration was elected, and Jacob Kohl, a trader from a line of several generations, assumed the post of mayor. In 1567 one more mayor was elected in order to share increased official obligations. While finding Kuressaare as a village like Magnus did, King Frederik II of Denmark confirmed civic rights and added privileges, introduced two honorary mayors’ and five councillors’ posts as well as two paid offices: the city bailiff (Hausvogt) as a representative of the Danish vice-regent and the clerk of the court (Gerichtssekretarius, lat. syndicus) as a representative of the Saaremaa provincial court. The number of citizens who swore allegiance to the King was 54. At the end of the 16th century there were about half a hundred citizens’ families and a couple of hundred cottagers. In 1622 the reform-minded king, Christian IV, gave the right of supplying salt and wine to the islands of Saaremaa, Gotland and Bornholm to the Helsingör-based Gotland Company (Danish: Gutlandske Kompagni). Mayors of Kuressaare, Cordt Schaushausen and Christoffer Prediger, city bailiff Ewold Matzen and the traders Jacob and Friedrich Kohl were admitted as shareholders. In 1624 the king demanded from the Saaremaa people that they should acquire their own ship, for which 3,541 thalers were collected. The number of shareholders was 41 – noblemen, officials and traders. Kuressaare became wealthier and started to grow. The most important source of income was the port, because half the customs ended up in the city’s treasury. Mainly rye, as well barley and beef were exported. The grain mainly went to the Netherlands and the home port of most of the cargo ships that arrived here was Amsterdam or Rotterdam. Salt, iron, wine etc. was imported. The fleet of Kuressaare grew. The new paradigm of the development of the city is connected with a new city centre. Its first focal point was the market square where the present Liberation monument stands today and where the first business streets merged. The first extension of the city territory was a church burnt down during the Kalmar War. A street network of triangular squares characteristic to Kuressaare developed. They mainly functioned as markets. Handicraftsmen’s guilds were set up side by side with those of traders. Under the Bromsebrö peace treaty Saaremaa passed to Sweden in 1645. Kuresssaare then had 83 citizens’ families. Privileges were renewed by Queen Christina, who treated Kuressaare as a city (Stadt). On 25 November 1648 the Queen established the Kuressaare County which became her subsistence land after her abdication. New guilds were set up, the weigh house built in 1664 and the town hall in 1670. Kuressaare developed into a European city the development of which was stopped by the Northern War and the Plague. The study of the Kuressaare Fortress that took place in the 1970s and 80s mainly focused on its oldest parts – the convent house and the curtain walls. The earthen fortifications and all the buildings’ construction engineering history were practically not studied at all. 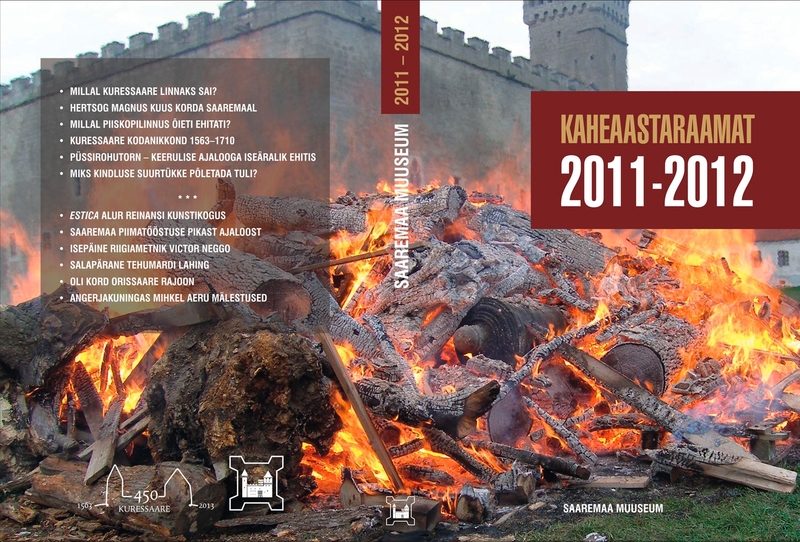 Starting from 2009, very extensive archaeological digs have taken place during the past three years in the framework of the Enterprise Estonia Saaremaa Museum project, Development of the Kuressaare Fortress as a Tourist Attraction, and building history information connected with various structures has been received. One of the sights studied has been the Gunpowder Cellar in the South Bastion, which stands out mainly for its relatively rare construction engineering method. So, the cellar used as the gunpowder store has double vaults: a second vault has been built into a room that already had a vault and so there is a 30 to 60 cm ventilated space between the two vaults. Compared with other gunpowder deposits that have come down to our days or have earlier existed in Estonia (in Pärnu, Paide, Narva, Haapsalu, Tallinn and Tartu), such a solution is rather rare. There is information about a gunpowder deposit from the end of the 17th century in Tallinn of exactly the same design (no longer extant today). Of the existing former gunpowder cellars the Tartu Gunpowder Cellar has the closest similarity with the Gunpowder Cellar of the Kuressaare Fortress in terms of its building logic. Although totally different in scale, the room of the deposit is separated from the rest of the structure and from the surrounding earth by means of a ventilated room filled with air. In the opinion of the archaeologist Garel Püüa the Kuressaare Gunpowder Tower has been built at the end of the 15th or in the early 16th century. Initially it was a mediaeval corner tower of the perimeter wall. When the bastions were built the tower was buried under the ground. For the first time the tower was mentioned as a gunpowder tower in a map of the fortress dated 1706. In most maps of the fortress dated from the 18th century the tower still has a simple vault and the double vault solution has only been shown in the map dating from 1793. The tower was used for its original purpose until the year 1836 when the Kuressaare Fortress was struck off the list of Russian military fortifications. There is no closer information about the use of the Gunpowder Cellar during the next one hundred years. It rises once again into pages of history in connection with a Communist mass murder committed in the Kuressaare Fortress and its vicinity in 1941. Some of the ninety victims were buried under the floor of the cellar and then an attempt was made to blow up the tower in order to hide traces of the murder. In memory of the event and of the victims a permanent exhibition was opened in the restored Gunpowder Tower in September 2011. While cleaning the moat of the Kuressare Fortress at the end of the Soviet period, six more or less similar cast-iron cannon about 210 cm long and weighing about half a ton each were found from there. The bore diameter of all the pieces is 9 cm, more or less corresponding to the six-pound cast-iron cannonballs (“sixpounder”). There are signs of hits received in battle on all the cannon – traces of bullets, case shot or cannon ball hits, surfaces scratched by shell fragments, a broken gun carriage mortise, etc. It is possible that there could be trophy weapons among them. As the cannon are very similar by their calibre, outward appearance and proportions, bearing in mind their manufacturing technology, optimal opportunities of use and design dictated by requirements strength, the cannon could have been cast in the period from the second half of the 18th century to the early 19th century. After the artillery pieces were brought out from the moat, they were mechanically cleaned of mud and most surface corrosion products and covered with linseed oil. But it was immediately clear after the preliminary cleaning and placing them on gun carriages in front of the main entrance into the castle that the corrosion of metal was not on the surface alone but had spread into its interior. But crystallization of salts that had worked its way into microcracks of the material could cause disintegration of the objects into smaller pieces. As in twenty years that process had clearly activated, it was necessary to conserve them to in order to put a stop to their further disintegration. The work started in the autumn of 2011. To carry out the process I decided to use the heating-sublimation method, in which a constant temperature of 700–900°C is required to be maintained during a longer period of time (8 to 10 hours) by means of burning wood in a large fire. The work took place in several stages. In the middle of October we cleared the bores of stones, empty bottles etc. It appeared in the course of the work that one of them still had a ball in its bore. At the same time the site of the fire was prepared and fuel was acquired. On the eve of burning the cannon we had brought to the site and placed on a wet aspen wood base all the six cannon that needed “treatment by fire”. The fire was lit at 15.40 hours on October 28 and during the next hours the cannon were kept red hot as fuel was constantly added to where the fire had burnt lower until the early hours of the next day. In the afternoon the fire was still smouldering. Next, the cannon were processed with sand spray and were covered with a solution of tannin and left them for wintering under a Kuressaare Fortress vault. The cannon had “survived” the winter more or less well: there was some corrosion due to excess moist from keeping them under a fabric tent and surface corrosion due to condensate water but no deep and active foci of rust could be observed. In the middle of July 2012 we cleaned the cannon one more time, this time only with hand and rotor brushes and covered them with a solution of tannin. As the mounts had not been completed in time and placing them to their permanent location on the Northern Bastion was not possible, the cannon did not yet get their final polish. The work will be concluded in 2013. As part of the connoisseur Sven-Alur Reinans’ (1932–2010) wide-ranging interests, he was intrigued by older graphic art on Estonian themes. Although the portrayal of Estonia and Estonians in Baltic German and Western European artwork was only one of his many interests, it did not remain superficial but was also manifested in his becoming a collector of these works. Graphic “costume albums”, depicting people of various social classes and ethnicities, began to be compiled in the 16th century, during the Renaissance, but the genre reached its peak at the turn of the 18th and 19th centuries. Fifteen prints from this genre have reached the Art Museum of Estonia thanks to the Reinans family, but A. Reinans had also brilliant relations with Saaremaa Museum. The earliest work in Reinans’ Estica collection is an engraving from the late 18th century depicting a young Estonian woman, originating from Johann Gottlieb Georgi’s (1729–1802) work “Описание всех в Российском государстве обитающих народов…”. Georgi relied on many different sources, but the huge work was published under his name, at first in 1776–80 in German. Illustrations as copper engravings were most created by Christoph Melchior Roth. Many Western European engravers copied and used the motifs of the Estonian women, adapting them, in accordance with their abilities and to suit the styles of later periods and settings (G. Gerhardt and E. Harding). In one print, published in Paris in 1788, Estonian sleeves have been replaced by a corset (J. G. de Sauveur). Yemelyan Korneyev (1780–1839) was assigned in 1802–05 by Tsar Alexander I to draw on another research trip across Russia. His work with 95 engravings first appeared in French in Paris, published by D. Calos, with the aquatint engraving “Livonians”. A number of other collections of prints depicting peasants in folk costumes appeared in the middle of the 19th century. One collection, compiled by Théodore de Pauly, dedicated to Tsar Alexander II, “Ethnographic description of the peoples of Russia, issued on the occasion of the 1000th anniversary of the empire”, was published in St. Petersburg in 1862. The Alur Reinans’ collection includes two lithographed illustrations from this book. One of them depicts (drawn by Viale after Carl Russwurm) coastal Swedes from Pakri and Vormsi, another page depicting Estonians is signed “Estonians from Mihkli village”, and its source material is a drawing made by August Wilhelm Georg Pezold (1794–1859). In 1844, a page from “Russian costumes”, depicting the inhabitants of Rannapungerja and drawn by Georg Wilhelm Timm (1820–1895) of Riga, was printed by the Paris-based Lemercier lithographer. The provenance of some other prints remains still unknown. The first Estonian “costume album” was compiled by Friedrich Sigismund Stern (1812−1889). His 20-page series of lithographs, limited to peasants from 12 parishes of Saaremaa and Muhu islands, depicts Estonians in their native element in the mid-19th century. Stern was born in Kuigatsi (Löwenhof) manor in Valga County, studied art in Tartu as a private student of Carl August Senff, and lithography techniques with Georg Friedrich Schlater. In 1838, Stern received the academic degree of freelance artist from St. Petersburg Art Academy. He moved to Kuressaare on the island of Saaremaa in 1841, and dedicated himself to print-making in addition to other fields. In 1859, the 14-print series “Folk costumes of 12 Saaremaa parishes” was published, followed presumably in 1871 by the 20-page series “Album of Saaremaa peasant costume”. Four Stern lithographs (restored proofs) can be found among Reinans’ Estica prints. Cattle has been kept on Saaremaa for thousands of years. The first written records of the processing of milk, cheesemaking, go back to the years 1569–71. More extensive making of dairy products on manor dairies began in the 19th century when the first specialists from abroad arrived on Saaremaa. Adolf Imholf, Emil Spring and Albert Schlup from Switzerland and later also Peeter Purin from Livonia became known. A. Schlup stood out for his versatile economic activity and the high quality of his cheeses, which received several gold and silver medals at Russian and European fairs. The milk yield of cows as a result of cattle breeding made it possible also for farmers to earn profit from their milk. The first dairy associations on Saaremaa were set up in 1912–13 at Valjala and Püha but World War One interrupted their activity. Establishment of dairy associations got a new swing in the initial years of the Republic of Estonia, when the state saw this as an opportunity of farmers getting better off and of paying off the foreign debt of the country. The then county government instructors, Hendrik Otstavel and Jaan Teetsov, did a lot to establish dairy associations on Saaremaa, not sparing time and efforts in carrying out explanatory work in the press and in the organization of cattle breeding courses. Later they became the Saaremaa County Governor and his deputy. The first dairy association set up in the Republic of Estonia was established in Kuressaare in 1923, and later several of them were set up also at other locations. To get the necessary loan some of the farmers even mortgaged their farms. In order to organize more effective milk purchases, small dairies, creameries where only skimming milk took place, were set up in villages. In 1930 there were 13 dairy associations and 39 creameries in the county where 1,270 tons of milk was processed and 52.1 tons of butter was made. Bankruptcy of some export mediators triggered a setback to the activity of the dairy associations. After the major economic crisis of the 1930s competition increased particularly on the Sõrve Peninsula where even explosives were taken into use in order to increase purchase areas and a so-called milk war broke out. In 1939 Saaremaa County had about ten viable dairy associations, of which the best known were Valjala, Muhu, Tõlluste and Pöide. The latter was simultaneously one of the biggest dairy associations in Estonia. 13,760 tons of milk was processed and 559 tons of butter and six tons of cheese were made in the county. Due to the Soviet occupation new dairies were no longer built and milk purchase obligations were set. Attempts were made to increase sale of milk by selling goods in short supply against milk. So the Laadjala Dairy Association was obliged to supply residents of Kuressaare City with milk products on the basis of purchase licenses. The big war-time fuel shortage did not significantly upset dairies as they worked by steam power and manual labour. The farmers started to jointly re-establish dairy associations and somewhat later electrification began. Dairy associations also busied themselves with the cultivation of lands, threshing, grinding grain, cooking bread and even selling alcohol. Dairies were extended also in the Soviet period and assortment was increased. A model cheese factory was put up in Valjala in 1963 and in 1965 the Central Saaremaa Dairy Plant in Kuressaare. Transport of milk and its processing was centralized. After the reestablishment of independence of Estonian Republic Saaremaa mainly specialized in the production of cheese and butter, with the assortment of cheeses considerably increased. Thanks to the introduction of new technology, the quality of dairy products has increased from year to year and the expenditure of thermal and electrical energy per product has contracted. The Saaremaa dairy industry, which set off from village saunas, has now arrived at an automated mass production level, producing 681 tons of butter and 3,245 tons of cheese in 2012. The German occupation, which had lasted the longest on Saaremaa, ended in Estonia in November 1918. The Provisional Government, which appointed into office various officials with special powers, started to organize life in the country. Among others, such officials were commissars of the Provisional Government who were appointed into office in the counties in accordance with a decree passed on 20 December 1918. The commissars were appointed to Harju County and Tallinn, to Lääne County, the city of Narva, Petseri County and the city of Petseri, Pärnu County and Pärnu, Saaremaa, Tartu County and Tartu, Viljandi County and Viljandi, Viru County and Rakvere and to Võru County and Võru. The commissars were to become representatives of the central government; they were appointed at the interior minister’s proposal and they carried out supervision of state and local government institutions. They were to ensure that national acts and regulations of the government would be punctually observed and that the officials’ activity would take place within the fixed legal limits. In most parts of Estonia former representatives of the government were appointed commissars, but on Saaremaa the Kuressaare-born Victor Neggo (1890–1942), member of the National Council, was appointed instead of the earlier commissioner Johan Ainson (1873–1962). His name as commissar has resounded more in different writings on history compared with his colleagues, above all due to events of the mutiny in the Saaremaa County in February 1919 but there are also other keywords connected with his name: Saaremaa’s difficult economic circumstances, issues of land, relations with the local authorities, the person of the commissar etc. The short but eventful term of his office ended for Neggo on July 1919 when he handed over his post to his substitute. As commissar he attempted to improve Saaremaa’s circumstances as he saw it fitting, but due to a too short term of office many of his ideas could not be carried out. One of the obstructions was conflict with local persons in power, and certainly many of the misunderstandings were due to his character. One thing is clear, however: at any rate he left a considerable trace on the local life. After his post as commissar Victor Neggo worked, among other things, as teacher and school headmaster, taking part in the work of several public organizations, writing books and articles. Soviet power arrested Victor Neggo and deported his family (except his daughter, Urve); Victor Neggo was shot at the Solikamsk Prison camp in the Perm (then Molotov) Region on 15 June 1942. Late in the evening of October 8, 1944 one of the most gruesome battles of World War Two took place in the vicinity of the Saaremaa Island village of Tehumardi. Avoiding a battle with German units that had taken a defensive position on the Nasva River, advancing Soviet units moved in the direction of Saaremaa’s western area north of Mullutu–Suurlaht lakes. After passing them, a reinforced advance party set up on the basis of the independent 307th anti-tank division (about 370 men under the command of Major Vladimir Miller), moved to the head of the Soviet troops, forcing their way in the direction of the Sõrve Peninsula and arrived close to the sea at Tehumardi Village by the evening of October 8. Slightly later, coming from the direction of Kogula, also the 1st Battalion of the 917th Regiment (about 300 men under the command of Maj. Grigori Karaulnyi) arrived at the Kuressaare–Sõrve road. Due to poor reconnaissance the Soviet units’ commanders that had arrived at Tehumardi had no information about the presence of German units east of them and retreating from the direction of Kuressaare. At the same time, two battalions of the 67th Potsdam Grenadier Regiment of the German 23rd Infantry Division (700 to 750 men) was retreating from their defence positions on the Nasva River. After the leaders of the retreating army group received information of the presence of Soviet forces near Tehumardi, the 2nd Battalion of the 67th regiment (commander: Hauptmann Klaus Ritter) moved on in accordance with the command in order to break through the Soviet forces in a surprise attack. Simultaneously the First Battalion (commander: Hauptmann Hermann Ulrichs) separated from the column at the Järve Inn and in accordance with orders turned into the Sõrve Peninsula along the seacoast, not taking part in the battle. In the course of the columns’ movement in the night darkness the battalion headed by K. Ritter managed, moving as a column after a USA tankette the battalion had earlier received as a trophy, managed to wedge itself between the 1st battalion of the 917th Red Army Regiment, making the Soviet units that had remained at the side of the road, unable to fight. Having moved on about one kilometre the Germans surprisingly met with the Soviet battle group under the command of Major Miller with whom a largely spontaneous clash developed and soon turned into a hand to hand fight with numerous victims. There is a shortage of reliable data about the number of men killed and wounded in the Tehumardi Battle. At the same time it meant for two battalions of German soldiers rescue from certain destruction or imprisonment at least this time. The Soviet forces’ rapid advance on Saaremaa until that time stopped after the battle at least for twenty-four hours, which made it possible for the Germans who were retreating rather chaotically, to start organizing more serious defence for the first time in the vicinity of Salme and Üüdibe. After the Second World War, Soviet propagandists attempted to picture the Tehumardi Night Battle as a remarkable victory of their forces. A lot of literature distorting historical truth was published and its influence is largely felt even today. Information concerning circumstances of the Tehumardi Battle will apparently remain unavailable to the public at large for a long time to come. It can be presumed that there is still a lot valuable information unavailable in Russian archives. On the other hand we can hope that archival materials that provide important new information that had been believed lost on the German side could now become available for the public. After World War II the Soviet Union unified the administrative division of the Baltic countries it had occupied, making it identical with that of Russia. Thirty nine rural districts, of these two in Saaremaa County, were set up in Estonia under a decree of the Presidium of the Estonian SSR Supreme Council issued on September 26, 1950. From then on the eastern part of Estonia’s biggest island became Orissaare District, which also comprised Muhu Island. From January 1959 it was once again unified with the Kingissepa District with the centre in the present city of Kuressaare on economic and political considerations. That period of eight and half years is the main issue of the article. The major part of the overview is devoted to the living conditions of the district centre and opportunities of cultural entertainment. The then administrative reform was carried out in connection with the initial period of forced collectivization, which needed closer control of the political and economic authorities over the rural areas’ residents’ life organization and of the process of changing the economy. It was a period of the disintegration of farm economy and limitation of property rights darkened by mass reprisals. Numerous people who had been estranged from landed property moved into cities or settlements of town type where they found stable paid work. People from the earlier county centre of Kuressaare and some local people who had shown loyalty to Party and Soviet bodies were involved in the leadership of the district. The district centre, Orissaare Village, which has developed at the location of former manor and a traffic junction next to Väike Väin Strait, developed into an important business, schooling and service establishments’ centre, which left the former rural municipality seats at the mercy of collective and state farms (kolkhozes and sovkhozes). There were great problems with the accommodation of officials of the district executive committee, as initially there were few suitable dwellings; the place didn’t even have a canteen or hospital and the school was only being built. Offices were scattered all over the village. Due to the shortage of building materials and experienced labour building work wouldn’t succeed. Administration was disturbed by rearrangements due not to competence but to political “maturity” of the staff. The militia and security forces had a great power. The Orissaare District accounted for about 40 per cent of the territory of Saaremaa and Muhu islands. Initially there were 18 village soviets under the administration of the district. By a decree of 17 June 1954 the number of village soviets in the Estonian SSR was cut by half. In the Orissaare District their number fell to 11. The district was overwhelmingly agricultural with quite weak development of industry. Fishery was an important branch of economy for the development of which even a motor fishery station was established. Today the small town of Orissaare has nearly one thousand residents; it is the centre of a municipality of the same name, which has developed along with the surrounding industrial companies into an educational, cultural and shopping centre for the whole of Eastern Saaremaa. Mihkel Aer’s (1898–1987) memoirs arrived at the Muhu Museum thanks to his daughters, Naima and Elvi, and a relative, Andres Pitka. The memoirs are at the museum on eight compact discs. A large part of them are Mihkel’s monologues, where in addition to memoirs he also speaks about his convictions. In one case we have to do with an interview where the interviewer, Mr. Paap, reads as an introduction a long monologue. Mihkel’s tales of his life at his childhood home at Koguva, war adventures during World War II, reminiscences in connection with shipbuilding offer a lot of interesting material. Mihkel also briefly touches upon the story how he left Estonia and about his life in Canada. The second part of his memoirs is made up of criticism Estonian life and the society. Mihkel repeatedly returns to the issue and arrives at the conclusion that the responsibility for the disappearance of the Estonian state did not lie on foreign powers alone, but Estonians themselves had prepared the ground for it, particularly Estonian intellectuals and officials. This part of the reminiscences is a bit too moralizing and becomes slightly tedious, as Mihkel repeatedly comes back to the same issues and points of view. Mihkel Aer was born at Andruse Farm, Koguva village on Muhu Island. Through her mother Mihkel came from the line of the Schmuul free peasants. After his father’s death Mihkel was forced to earn upkeep for the family. Mihkel took part in World War I, and built two ships together with men from the same village. In 1930 he was mainly busy catching eel and exporting them to Germany and Sweden. In 1926 he moved to Saaremaa, settling in Kaunissaare Village in the Pöide Rural Community. He was an organizer of Estonian fishery, being a member of the Fishery Chamber as well as of the local fishermen’s organization, the Kõrkvere Fishermen’s association. It was a miracle that he escaped Soviet reprisals in 1941 and when the Red Army was approaching in 1944 he no longer started to wait for another miracle but fled to Germany with his family and later moved to Canada. There he worked his way up as an enterprising man and built a nice home along with his wife, Hilda, in St Catharines in the Ontario Province of Canada. A spinning wheel Mihkel made was for years in the exposition of the Canadian Museum of Civilization. Mihkel’s daughter, Elvi Aer is bibliographer; Naima Aer has studied photography at university and has decorated wooden objects with Estonian national patterns, for which her father made blanks. Mihkel’s long and fruitful life ended at the age of 89 in 1987.